The Rebel Sweetheart. : Foodie Goodie | Budae Jjigae. I've been feeling very 'Seoul-sick' lately. I miss the nippy night air in Seoul. The sights, sounds, and spicy food. Our tiny, one-bedroom apartment and its heated floors. Our well-stocked pantry whenever we're in Seoul. And my husband, most of all. Watching this week's episode of Running Man made me miss Korea even more. 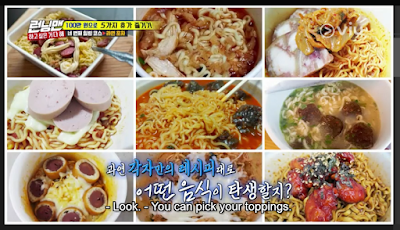 Especially after seeing Yu Jae Seok, Haha, Song Ji Hyo, and the rest of the gang - health buff Kim Jong Kook included - wolfing down ramyeon at a ramyeon buffet somewhere in Seoul. 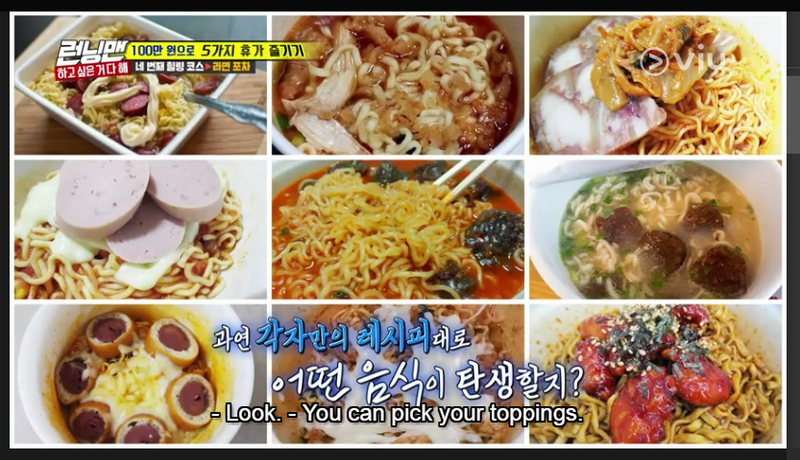 Ramyeon overload on Episode 373 (Do Whatever You Want) of Running Man! I felt so 'homesick' and so hungry afterwards that I decided to whip up a (ramyeon) storm in my kitchen. 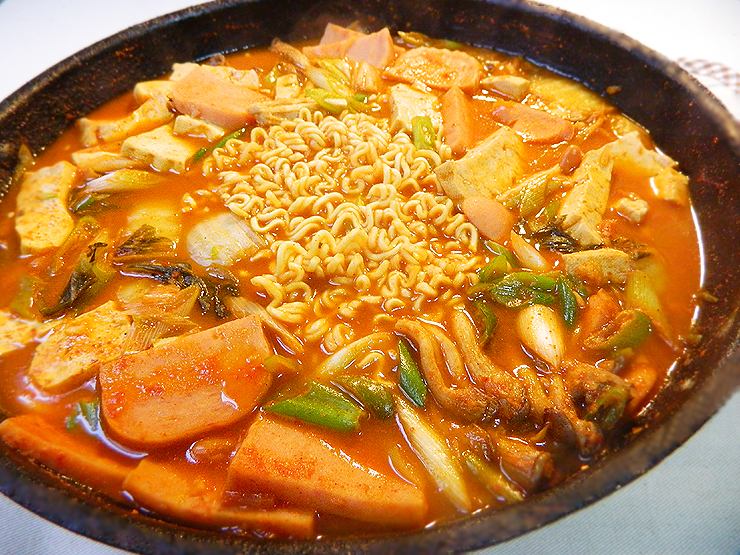 And by that I mean 'Budae Jjigae' - a type of stew typically made with ham, sausage, baked beans, and kimchi. Haha enjoying his bowl of ramyeon. 'Budae' is the Korean term for 'army base', while 'jjigae' is the Korean term for 'stew'. The name 'budae jjigae' literally translates into 'army base stew', and there's actually a sad story behind it. In the 1950's, Korea was known as the world's poorest country. Food was extremely scarce after the three-year war which divided the two Koreas, and most people in South Korea had to depend on relief aid from the United Nations and other countries. 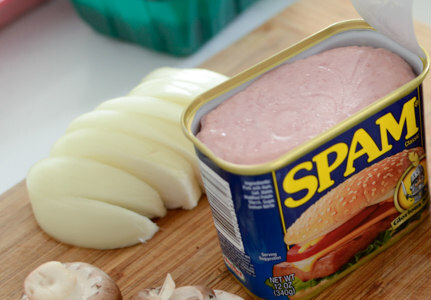 Canned goods such as Spam, sausages, and pork and beans from the US army bases supplemented the food shortage during that time. 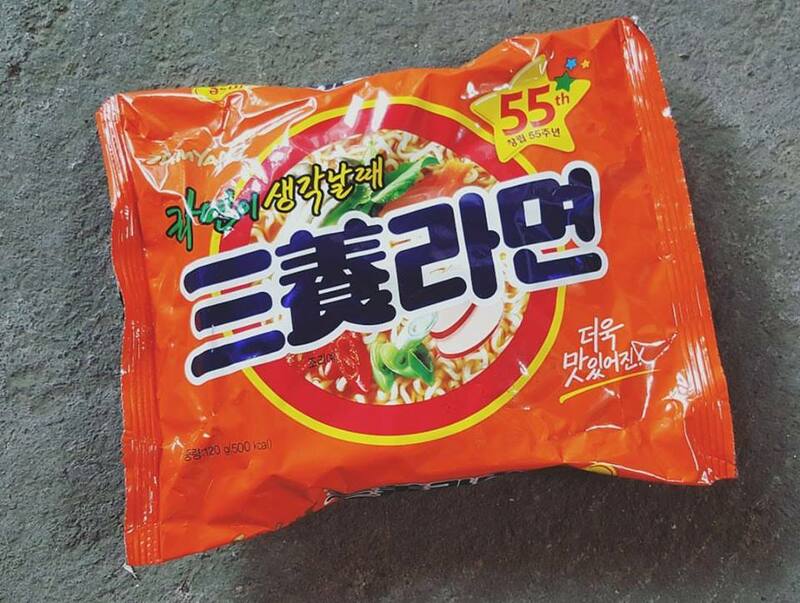 A restaurant owner in Uijeongbu, where US army bases are stationed, started to make a stew using these canned goods. Mixed with the local Korean flavor, the budae jjigae was born. Since then, this dish became immensely popular all over Korea, and is slowly gaining popularity in other parts of the world. Even world-renowned chef and food critic Anthony Bourdain loves budae jjigae, so much that he even taught Anderson Cooper and Mario Battali how to make it. Here's how I made mine. Take note that this dish actually requires kimchi. However, I'm not really fond of kimchi so I used Chinese (napa) cabbage instead. If you like kimchi, then by all means, you can use it for this dish. 1. Combine all the ingredients for seasoning in a small bowl. Mix well. 2. In a large shallow pot, arrange all the stew ingredients with the ramyeon noodles on top. 3. Add the seasoning to the pot, and pour the chicken stock over. 4. Bring the pot to medium heat and let it boil. Mix the seasoning as the stew boils. 5. Untangle the ramyeon noodles and spread them out in the pot. Do not overcook! 6. Serve while hot. Top with sliced cheese if desired. I love Korean food. I have to try this recipe. Thanks for sharing. My niece is really a huge fan of any korean food. Actually she is a kpop lover. And I will definitely shared this to her, I am sure that she reallt like this.